In the United States, the average desired family size is two children. To achieve that family size, women spend an average of about three years pregnant, postpartum or trying to become pregnant, and three decades—more than three-quarters of their reproductive lives—trying to avoid pregnancy. Nearly half of all pregnancies in the United States each year—almost three million—are unintended. There were 67 million U.S. women of reproductive age (13–44) in 2014. More than half of these women (38 million) were in need of contraceptive services and supplies; that is, they were sexually active and able to become pregnant, but were neither pregnant nor trying to become pregnant. WHO NEEDS PUBLICLY FUNDED SERVICES? Of the 38 million women in need of contraceptive care in 2014, 20 million were in need of publicly funded services and supplies because they either had an income below 250% of the federal poverty level or were younger than 20. Among the 20 million women in need of publicly funded contraceptive care, 77% (15.5 million) were poor or low-income adults, and 23% (4.7 million) were younger than 20. Between 2010 and 2014, the number of women in need of publicly funded services increased by 5%, representing one million additional women. This growth in need was primarily among poor and low-income women; the number of teens in need declined during this period. Of the 20 million women in need of publicly funded services in 2014, 15.5 million were adults living below 250% of the federal poverty level; 6.2 million of these women were poor (with a family income less than 100% of the federal poverty level) and the other 9.3 million were low-income (with a family income at 100–249% of the federal poverty level). From 2010 to 2014, the need for publicly funded services increased by 11% among poor women and by 7% among low-income women. Implementation of the Affordable Care Act’s main coverage expansions in 2014 led to a significant decrease in the proportion of U.S. women who were uninsured. Between 2013 and 2014, the proportion of women in need of publicly funded services who were uninsured fell from 28% to 23%, a decrease of more than one million women. Of the 20 million women in need of publicly funded services in 2014, approximately 4.5 million were uninsured. Approximately 9.8 million of the women in need in 2014 were non-Hispanic white, 3.6 million were non-Hispanic black, 5.0 million were Hispanic, and the remaining 1.6 million women identified with other or multiple racial and ethnic groups. From 2010 to 2014, the need for publicly funded services increased by 9% among Hispanic women, by 6% among black women and by 2% among white women. Public expenditures for family planning services totaled $2.37 billion in fiscal year (FY) 2010. Medicaid accounted for 75% of 2010 expenditures on family planning, state appropriations accounted for 12% and Title X for 10%. Other sources, such as the maternal and child health block grant, the social services block grant and Temporary Assistance for Needy Families, together made up 3% of expenditures. 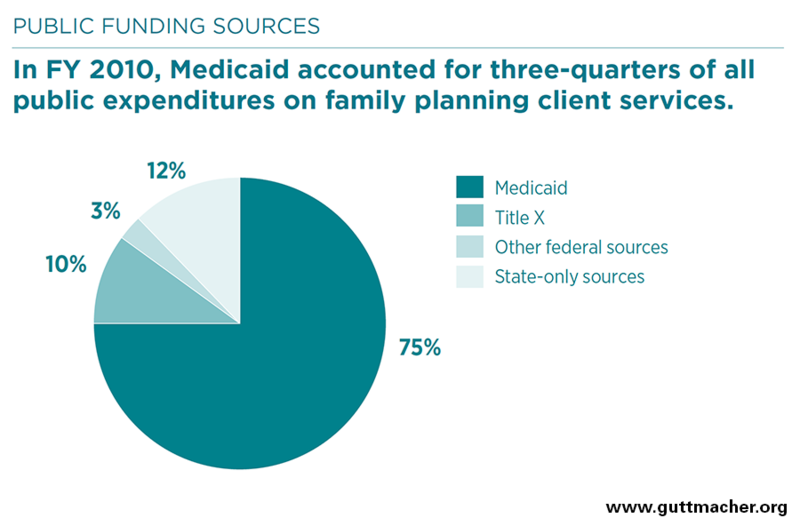 The joint federal-state Medicaid program spent $1.8 billion for family planning services in FY 2010. The program reimburses providers for contraceptive and related services delivered to enrolled individuals. The federal government pays 90% of the cost of these services, and the states pay the remaining 10%. Even among Title X–supported centers, Medicaid was the largest national source of financial support in 2010. Medicaid contributed 37% of all revenue reported by these centers, and Title X provided 22%. The remaining 41% came from state and local governments, other federal programs, private insurance and fees paid by clients. WHO RECEIVES PUBLICLY FUNDED SERVICES? In 2014, 7.8 million women—39% of all women in need of publicly subsidized care—received publicly funded contraceptive services from clinics (5.3 million) or from private doctors serving Medicaid enrollees (2.5 million). Teenagers represented 15% of contraceptive clients served by safety-net health centers in 2014; nearly one million women younger than 20 were served by these centers. WHERE ARE PUBLICLY FUNDED SERVICES PROVIDED? In 2010, subsidized family planning services were provided at 8,409 safety-net health centers—3,165 (38%) were federally qualified health centers, 2,439 (29%) were health department clinics, 1,324 (16%) were other clinics, 817 (10%) were Planned Parenthood centers and 664 (8%) were hospital clinics. More than one-third (36%) of women who obtained contraceptive care from safety-net centers in 2010 received services from Planned Parenthood sites, 27% from health department clinics, 16% from federally qualified health centers, 13% from other clinics and 8% from hospital outpatient facilities. In 2010, 82% of U.S. counties had at least one safety-net health center providing family planning services, and 72% of counties had at least one Title X-funded center. In 2014, there were more than 4,100 Title X-supported centers. That year, 71% of all women served by publicly funded centers (3.7 million) were served by centers that received some funding from Title X. WHAT SERVICES DO PUBLICLY FUNDED CENTERS OFFER? More than half of centers (54%) reported offering clients at least 10 of 13 possible reversible contraceptive methods in 2010, an increase from 35% of centers in 2003. Oral contraceptives, injectables (e.g., Depo Provera) and condoms were provided by more than nine in 10 safety-net health centers, and 80% offered emergency contraceptive pills. In 2010, more than half of centers (57%) reported being unable to stock certain contraceptive methods due to cost. The availability of long-acting reversible contraceptive methods increased significantly between 2003 and 2010. IUD provision increased from 57% to 63%, and the implant, which was unavailable in 2003, was offered by 39% of centers in 2010. As of 2010, centers with a reproductive health focus offered a greater range of contraceptive methods onsite and were more likely to have protocols to help clients initiate and continue using methods, compared with centers focusing on primary care. Similarly, Title X–funded centers provided a higher average number of contraceptive methods and were more likely to have protocols to enable easy initiation and continuation of methods, compared with centers not receiving Title X funding. In 2010, 39% of centers offered same-day appointments to new contraceptive clients, and 39% of centers offered extended hours in the evenings or on weekends. Among all centers, the average wait for an appointment was just over five days. Virtually all safety-net health centers provided pregnancy testing in 2010, and the vast majority offered HIV testing (92%), testing (97%) and treatment (95%) for other STIs, and HPV vaccinations (87%). Although safety-net health centers typically focus on serving women, most also offer services to men. For instance, 9% (more than 300,000) of family planning clients served by Title X centers in 2014 were male. Some 63% of Title X–funded centers offered STI treatment to men whose female partner had tested positive, and 57% provided STI services to men, regardless of their partners’ status. Additionally, in 2010, half of all centers reported that men received contraceptive services directly. More than six in 10 women who obtained care at a publicly funded center providing contraceptive services in 2006–2010 considered the center their usual source of medical care. For four in 10 women who obtained care at a family planning center specializing in the provision of contraceptive care, that center was their only source of health care. One in four women who obtained a contraceptive service in 2006–2010 did so at a publicly funded center. Of these, 9% obtained their care from an independent family planning center, such as a Planned Parenthood clinic or other facility that focuses on providing contraceptive care; 8% did so at a community clinic; 6% did so at a health department clinic; and 5% did so at a hospital outpatient or school-based clinic. Fourteen percent of all women who obtained contraceptive services in 2006–2010, and 25% of all poor women who received a contraceptive service, did so at a site that received funding through the Title X program. Ten percent of women who received a Pap test or pelvic exam in that period did so at a Title X–funded site. Eighteen percent of women who received testing, treatment or counseling for an STI in 2006–2010 did so at a Title X–funded site. Fourteen percent of women who were tested for HIV did so at a Title X–supported site. WHAT IMPACT DO FAMILY PLANNING SERVICES HAVE? In 2014, publicly funded family planning services from all sources (including safety-net centers and private doctors who accept Medicaid) helped women to avoid about two million unintended pregnancies, which would have resulted in nearly one million unintended births and nearly 700,000 abortions. Without publicly funded family planning services from all sources in 2014, rates of unintended pregnancy, unplanned birth and abortion in the United States might have been 68% higher, and the rate of teen pregnancy might have been 73% higher. In 2014, publicly funded family planning services provided by Title X–supported centers helped prevent nearly one million unintended pregnancies, which would have resulted in more than 400,000 unintended births and 300,000 abortions. Without publicly funded family planning services from Title X–supported centers alone in 2014, rates of unintended pregnancy, unplanned birth and abortion in the United States might have been 33% higher, and the rate of teen pregnancy might have been 30% higher. In 2010, publicly funded family planning services prevented an estimated 288,000 unplanned births that would have occurred less than 18 months after a previous birth. They also prevented an estimated 164,000 unplanned births in which the baby would have been preterm or low-birth-weight. 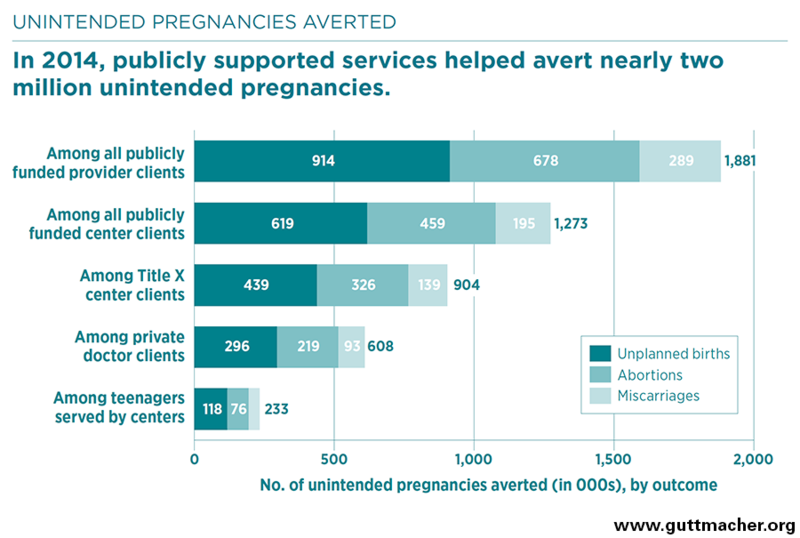 Services provided at Title X–supported centers alone prevented 152,000 closely spaced unplanned births and 87,000 preterm or low-birth-weight births. STI testing services provided as part of a publicly funded family planning visit prevented 99,000 chlamydia infections and 16,000 gonorrhea infections in 2010. Services provided at Title X–supported centers alone averted 53,000 chlamydia infections and 8,800 gonorrhea infections. In 2010, services related to cervical cancer prevention (including Pap and HPV testing and the HPV vaccine) provided as part of a publicly funded family planning visit prevented 3,700 cases of cervical cancer and 2,100 cervical cancer deaths. Services provided at Title X–supported centers accounted for 1,900 of the cervical cancer cases and 1,100 cervical cancer deaths averted. Altogether, the services provided at publicly funded family planning visits in 2010 resulted in a net savings to the federal and state governments of $13.6 billion. The services provided at Title X–supported centers accounted for $7.0 billion of that total. In 2010, every $1.00 invested in publicly funded family planning services saved $7.09 in Medicaid expenditures that would otherwise have been needed to pay the medical costs of pregnancy, delivery and early childhood care. 1. Sonfield A, Hasstedt K and Gold RB, Moving Forward: Family Planning in the Era of Health Reform, New York: Guttmacher Institute, 2014. 2. Finer LB and Zolna MR, Declines in unintended pregnancy in the United States, 2008–2011, New England Journal of Medicine, 2016, 374(9):843–852. 3. Frost JJ, Frohwirth L and Zolna MR, Contraceptive Needs and Services, 2014 Update, New York: Guttmacher Institute, 2016. 4. Sonfield A and Gold RB, Public Funding for Family Planning, Sterilization and Abortion Services, FY 1980–2010, New York: Guttmacher Institute, 2012. 5. Fowler CI et al., Family Planning Annual Report: 2014 National Summary, Research Triangle Park, NC: RTI International, 2015. 6. Fowler CI et al., Family Planning Annual Report: 2010 National Summary, Research Triangle Park, NC: RTI International, 2010. 7. Frost JJ, Zolna MR and Frohwirth L, Contraceptive Needs and Services, 2010, New York: Guttmacher Institute, 2013. 8. Special tabulations of data from Frost JJ, Zolna MR and Frohwirth L, Contraceptive Needs and Services 2010, New York: Guttmacher Institute, 2013. 9. Frost JJ et al., Variation in Service Delivery Practices Among Clinics Providing Publicly Funded Family Planning Services in 2010, New York: Guttmacher Institute, 2012. 10. Besera G et al., Male attendance at Title X family planning clinics—United States, 2003–2014, Morbidity and Mortality Weekly Report, 2016, 65(23):602–605. 11. Frost JJ, U.S. Women’s Use of Sexual and Reproductive Health Services: Trends, Sources of Care and Factors Associated with Use, 1995–2010, New York: Guttmacher Institute, 2013. 12. Frost JJ, Gold RB and Bucek A, Specialized family planning clinics in the United States: why women choose them and their role in meeting women’s health care needs, Women's Health Issues, 2012, 22(6):e519–e525. 13. Frost JJ et al., Return on investment: a fuller assessment of the benefits and cost savings of the US publicly funded family planning program, Milbank Quarterly, 92(4):696–749. Sonfield A and Gold RB, Public Funding for Family Planning, Sterilization and Abortion Services, FY 1980–2010, New York: Guttmacher Institute, 2012. Frost JJ, U.S. Women’s Use of Sexual and Reproductive Health Services: Trends, Sources of Care and Factors Associated with Use, 1995–2010, New York: Guttmacher Institute, 2013. Frost JJ, Frohwirth L and Zolna MR, Contraceptive Needs and Services, 2014 Update, New York: Guttmacher Institute, 2016.